This spring, Die Wolke Art Group hosts choreographers and dancers at Unit Motives for the 3rd consecutive year. 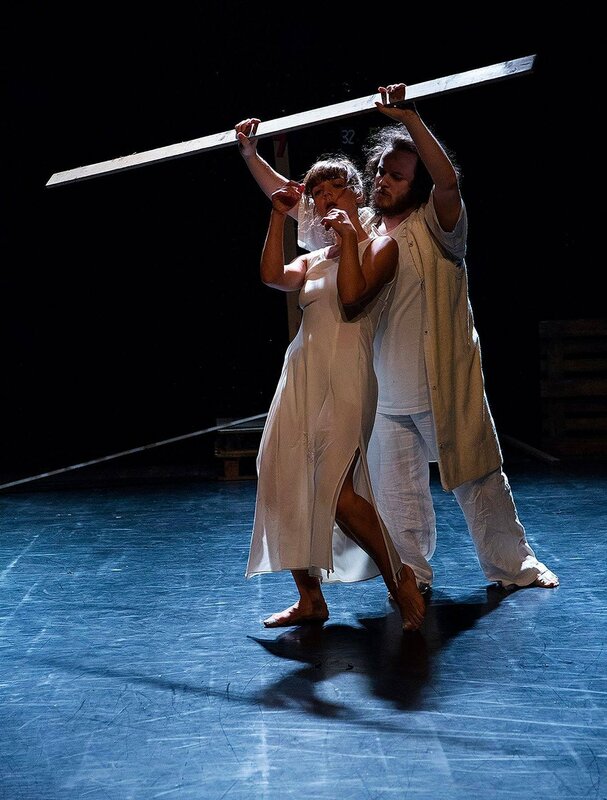 Unit Motives is an initiative for the creation of solo contemporary dance on musical works by great composers. This year, the event explores the different kinetic and choreographic approaches to the interpretation of works by the Groupe de Recherches Musicales, with composers such as Pierre Schaeffer, Bernard Parmegiani, Luke Ferrari, and Iannis Xenakis. The GRM was an electroacoustic music studio founded in 1951 by the musique concrète pioneer Pierre Schaeffer in Paris. Musique concrète is a form of experimental music that is based on acousmatic listening, that is, the consideration of sounds as separate from their producing sources, described by Schaeffer in his book Traité des objets musicaux. I will present a solo under the choreographic direction of Drosia Triantaki using Iannis Xenakis’ Orient/Occident . The individual works will be arranged and merged into a single performance that will explore contemporary and historical approaches to the work and philosophy of the composers. photo: armen Bazarian. with florence freitag, Berlin 2018. Valid as a Vowel (working title) is a fledgling collaboration between Nigro and Freitag. Dedicating ourselves in practice-based research to sound|dance - the relationship between body and voice - we explore the female body as a vocal vehicle and the female voice as an investigative medium for physical expression. The working title refers to our ability to go beyond language and discover other forms of communication; questioning words and their defining power on our realities. The basis of this research is the work of vocal artists, and Valid as a Vowel mentors, Alessio Castellacci and Irena Z. Tomazin. The thematic starting point of our work is the question of in|stabilities in our direct environment and the world. How do they manifest in the sounding body? The research will be divided into 3 phases in 2019: an initial residence at Altes Finanzamt in March, followed by a residence in Martinasco, Italy this May to expand the research with artists Mariana Camacho, Lisa Stewart, and Matteo D’Ercole, and the final working phase will return to Altes Finanzamt in late autumn. Hibernating, collaborating, and investigating at Ponderosa in February 2019 as part of their residency series. A creation week for HUA in collaboration with Project|Oracle artists Maré Hieronimus (Brooklyn) and Cory Neale (Philadelphia). 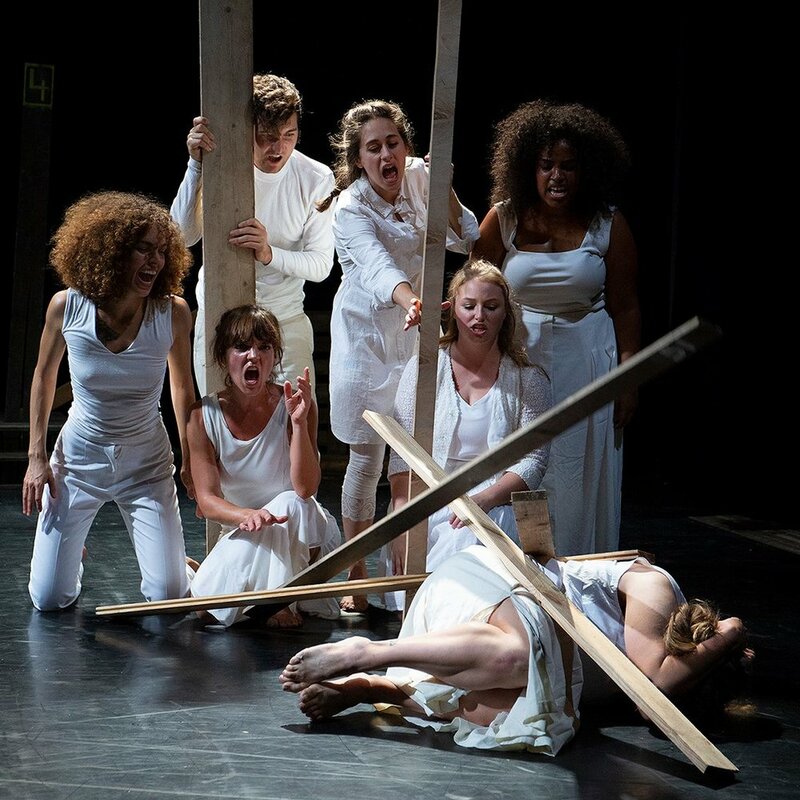 Our six weeks at ŠVESTKOVÝ DVŮR under Divadlo Continuo Theatre have come to an end with our final performance with the Accademia dell’Arte in Jihlava (CZ) on October 10, 2018. I am forever changed and left longing for the creative impetus that exists within such a unique company and working environment. “History, buildings, ideas, rules, stories and much more. As coded genetic messages we inherit in our DNA multitudes of information that, from generation to generation, travel time until they reach us. What we discover and meet daily during our lives was left by those who were here before us. We live in the scenery of the past, eras that we both belong to and are strangers to. The ones who have left this behind for us are gone. What do we do with this heritage? Do we throw it away as junk, restore it, let it be? Or do we build something new of our own? What will be left for the ones that will come after we are gone? Small explorations of body, landscape & lemons in Chianti, Italy, 2016. A collaboration between Nicole Nigro, Cory Neale, and Lisa Hayes. Sculptures by David Hollander. Huge thanks to La Macina di San Cresci. The four weeks with Familie Flöz flew by. A whirlwind of physical training, scenic devising, and studio showings featuring our masks and the Flöz masks. It was an absolute pleasure and I fell madly in love with wild Berlin! Studio Flöz, Berlin, 2018. Photo: Valerio Vallone. I just returned from an incredible two weeks of work with Familie Flöz and 28 other artists from 18 different countries. I built a mask based on my great grandmother Amelia and I will bring her to Germany where I will continue creating with Flöz. The new Flöz masks in Tuscania, Italy. Photo: Gianni Bettucci. Amelia. Born July 26th, 2018. "The World is Sound (TWIS) is a platform dedicated to the exploration of the human voice as a medium for physical expression in contemporary performance, and stems from the synthesis of different traditions of sound and movement. TWIS was initiated by voice artist, dancer, sound composer Alessio Castellacci and evolved from his close collaboration with singer, sound artist, choreographer Irena Tomažin and actor, director, sound researcher Robert Liethoff. Through this work the underlying principles of different disciplines are developed and connected into an integrated approach to the study of the human voice, to include its physical, emotional, imaginative and communicative dimensions." From May 21-25, 2018 I had the great pleasure of participating in Teatro C'art's advanced level clown workshop directed by André Casaca. I spent five days in Castelfiorentino working, running, laughing and playing... so very full of gratitude. Spring has sprung in Tuscany and I have been hard at work with Broken Jump! 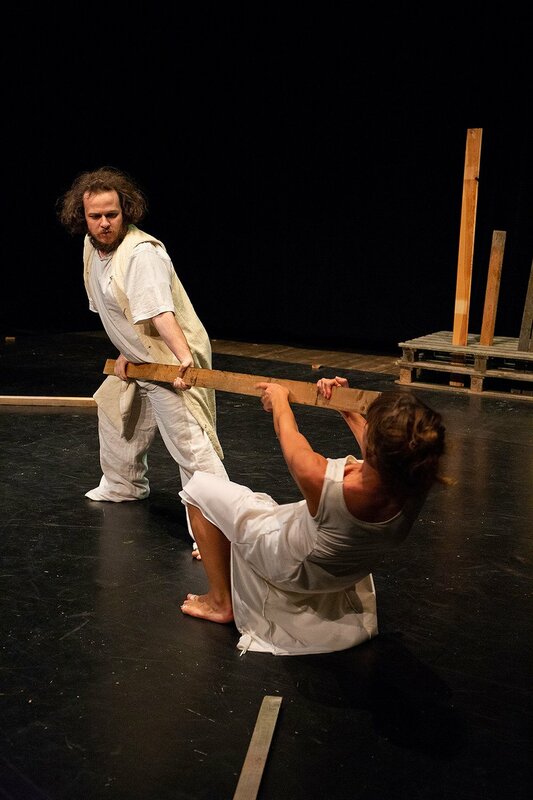 "Broken Jump is an artistic ensemble dedicated to the creation of theatrical events which take place in non-theatrical locations of particular cultural interest. The company works to maintain a liquidity which allows the ensemble to easily penetrate any found or chosen site in which a performance will take place. Based in Italy, Broken Jump has been able to draw from a pool of skilled international performers each with his and her own specialization." 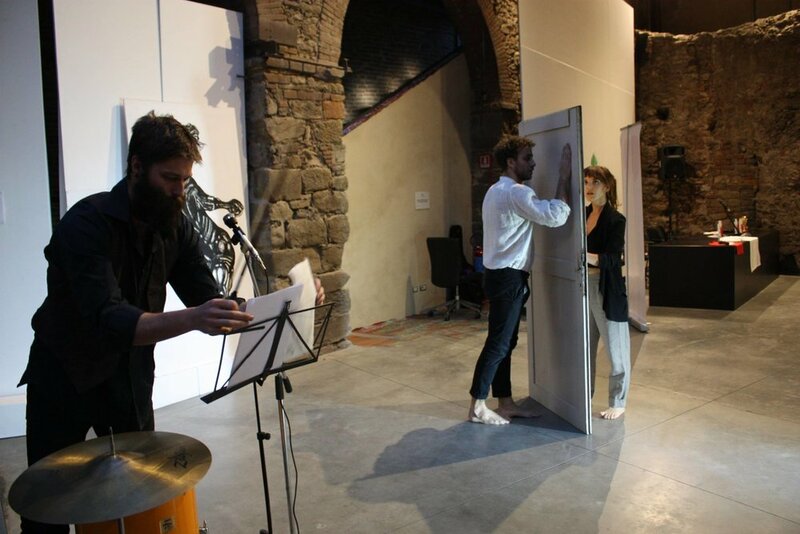 Gradlab performances have come to an end and along with them our final working period in Arezzo with Accdemia dell'Arte. I am grateful to have interpreted for Heidee Alsdorf in O How Flesh Folds, and for Faith Sullivan in Thirst (and Other Dreams of Drowning). their eyes were the colour of ripe apricots|and the intersection of joy & grief premiered on April 9th, 2018. Much gratitude to all those involved. is a new work created by Nicole Nigro in collaboration with Heidee Alsdorf, Rūta Marcinkenaite, Lindsey Root, Faith Sullivan & Sloane Teagle. Premiering April, 2018 @ La Stalla, Arezzo, Italy. On July 5th, 2017 I became a certified teacher of the Elemental Body Alignment System (EBAS), developed by Scott Puttman. "EBAS is a series of exercises designed for structural integrity and supported range of motion. Through anchoring and initiating movements via the pelvis, the body discovers its ability to efficiently articulate movement through experiential anatomy. The work deepens the students understanding of where movement comes from, how to align the body and to build a physical consciousness of open pathways of energy for movement. The system helps the learner to override the central nervous system creating new neuromuscular firings supporting a greater understanding of sensorial technique." The CrisisART Collective will host our annual CrisisART Festival this summer, in Arezzo, Italy from June 25-30th at Villa Godiola. I will be performing Ford Advantage on June 25th @ 22:00 as well as partaking in workshops and lectures. The CrisisART Collective's intention is to foster international collaboration that culminates in a festival of arts, activism, and collective engagement. For more information one CrisisArts please click here. An intimate evening of music, poetry, snacks, and good company! Featuring Elyse Brown, Kelsa Dine, Sean Henderson, Justine Hince, Zev Hurwich, Caroline Montes, Nicole Nigro, Brittany Roa, and Faith Sullivan. 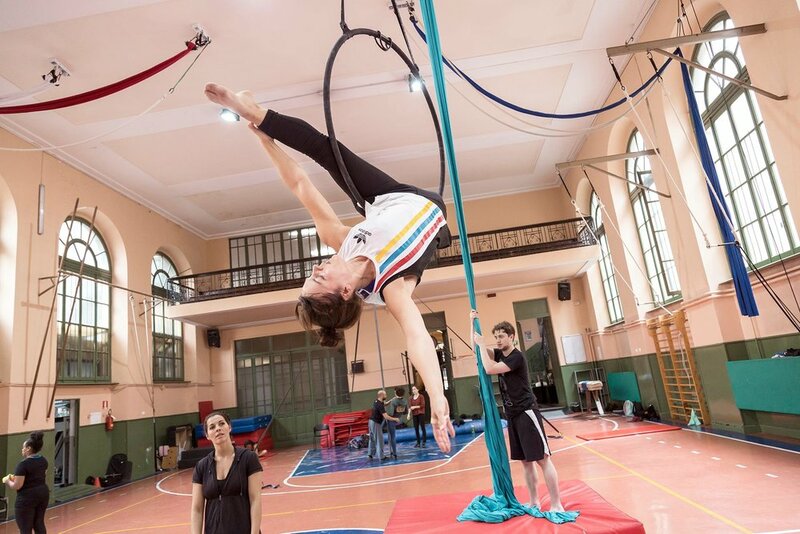 I chose the aerial hoop as my main discipline during my six weeks of intensive work at Flic! It was challenging, rewarding, and ultimately a magical time. My first year of study in Arezzo, Italy culminated with a final performance in Commedia dell'Arte! I had the pleasure of playing Pantalone, a great departure from any role I have interpreted in my performing career thus far. Next stop Torino to work with Flic Scuola di Circo. I think I am going to be quite sore! limoni, a work in progress inspired by landscape & lemons in collaboration with Lisa Hayes. limoni, august 2016. sculpture: david hollander. Summer adventure commences with moving to Italy and a self-directed residency at La Macina di San Cresci. I feel like it will be a beautiful season. Thanks to all those that are helping me get there. This series features new dance works that are energetic, fiery, fresh and spontaneous. Suitable for all ages. April 23 @ 8pm, 24 @ 4pm. Pia Bouman School, 6 Noble St.
Saturday's performance is followed by a catered reception. Sunday's performance is followed by a moderated discussion. Tickets: Limited Seating, please purchase tickets in advance. $14-$18, available for purchase online, or with cash payment at the door. A limited number of PWYC tickets are available for Sunday at the box office. Featuring work by: Terrill Maguire, Nicole Nigro, Greg 'Krypto' Selinger, Anne-Flore de Rochmabeau, Bee Pallomina & Johanna Bundon. Featuring performances by: Danielle Baskerville & Tyler Gledhill, Nicole Nigro, Greg 'Krypto' Selinger, Marine Rixhon, Marijoe Foucher, Liane Thériault, Gabriel Painchaud & Keven Lee, Bee Pallomina & Johanna Bundon. A work exploring minivans, privilege, and the intersection of joy and grief. Researched at Ponderosa Movement & Discovery in Stolzenhagen, Germany. Premiered as part of the P.O.R.C.H. Choreographic Module in August, 2015. Photo: Hope Davis. 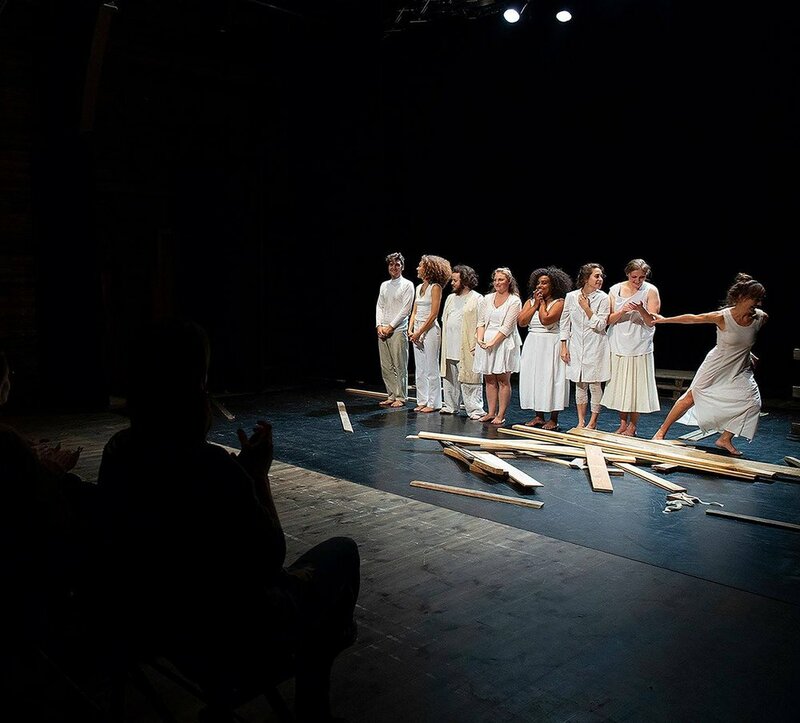 Augur, chashama Summer Performance Series, 2014.
photo: Cassandra Wiesner's Arrangement 2016. dancers: Kate Hanson, Alison Keery, Julie McLachlan. On February 26th & 27th @7:30pm The Beehive Collective is producing a mixed program called Mezzotint under the artistic direction of Cassandra Wiesner. Ford Advantage will be presented as part the program at The Citadel. 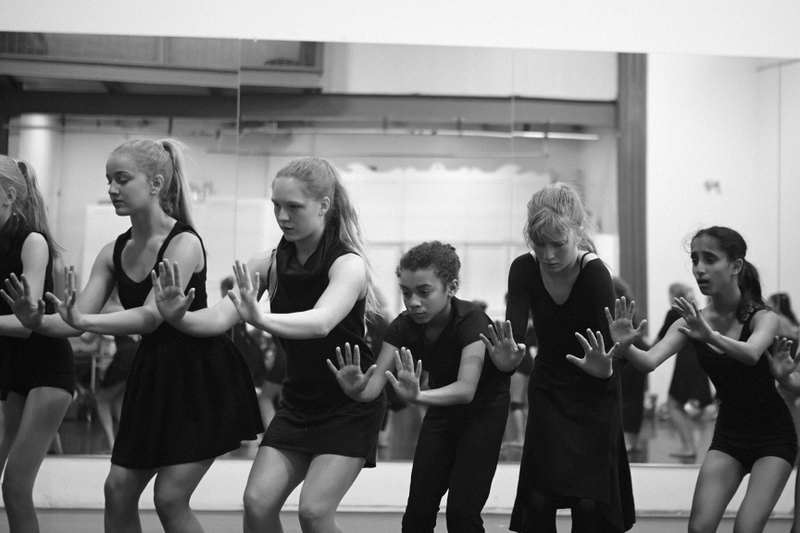 Haus of Dada made a little documentary about Anandam Dancetheatre's Glaciology! I share a few words about my experience inside the glacier! Spring Song 2015. Choreography: Nicole Nigro. 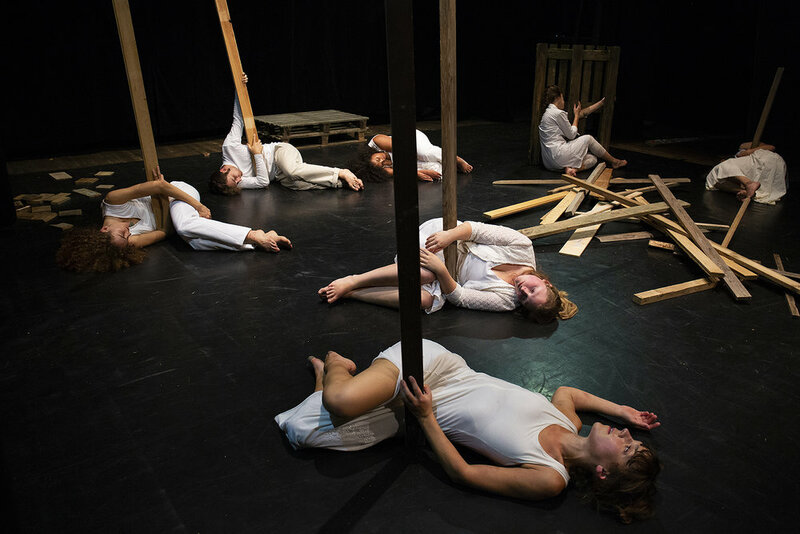 Dancers: Canadian Contemporary Dance Theatre's Core Apprentice Company. A human glacier slowly drifts through the city as a living landscape, continuously active for the full 12 hours. Using the movements of glaciers across the earth’s surface as an entry point, this piece explores states of density, collaboration, collapse, overpopulation, relocation, disruption, environmental tipping points, mass graves, icebergs, and melting ice caps. 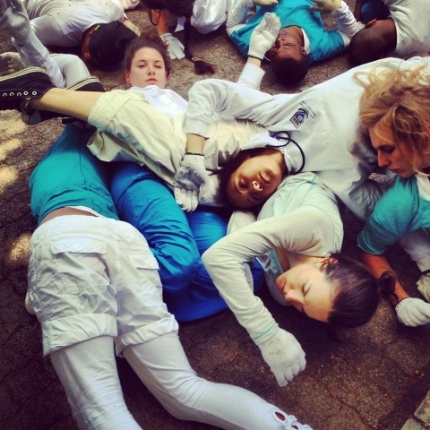 Glaciology is a site specific performance that combines choreography with human sculpture and interactive technology. This creates a surreal, constantly shifting image of bodies as landscape and simultaneously as capsules of history and memory; both human and geological. Glaciology works with many bodies in motion to evoke the permanent effects of human and ecological conflicts. It takes the audience through the past centuries by overlapping and contrasting these images and ideas with the indelible power of glacial movements across landscapes. An accompanying sonic score and interactive elements for this work can be found at www.anandam.ca. Anandam Dancetheatre creates live performances that explore the body as a curious and shifting filter for diverse viewpoints and practices. Their work is specifically fascinated by the present moment as an exchange and collaboration between people in a performative and social context. For them, this present-ness is energetic, transmissive, shamanistic, philosophic, embodied, physical, simple and clear. Hit focuses on repetitive and persistent beats that entwine sound, space, and time through a logic of labour and endurance. The rudimentary rendering can be heard as a lulling murmur or a grating noise; the volume will ebb and flow as the organic collective apparatus expends its energy. The performers are like stubborn automatons seeking to transpierce the material they are hitting. As sound factory workers, they leave their mark. The sound they produce is heard acoustically, but is also amplified and transformed. Christof Migone is an artist, curator and writer. His research delves into language & voice, bodies & performance, intimacy & complicity, sound & silence, rhythmics & kinetics, translation & referentiality, stillness & imperceptibility, structure & improvisation, play & pathos, pedagogy & unlearning, failure & endurance. He has performed and exhibited internationally. He currently lives in Toronto and is an Assistant Professor in the Department of Visual Arts at Western University in London, Ontario. Faculty 2015: Stephanie Maher, Maria F.Scaroni, Jassem Hindi & Guests. The Choreographic Module demands strong maturity that each choreographer is able to stay on track of their individual creative process. It is also the module with a slower and/or, if you choose, a single focus for your creative process and the development of a final performable piece. Time management, preparation, research and meetings between mentor and students is part of the daily process. Each week will be facilitated by a collaborative choreographic team leading 2 hours of group practice per day and then individual non-structured working time. Individuals will have enough studio time to create their own work, with access to constructive feedback, artistic exchange & research. This year the module will be primarily focusing on ones own solo process. Focus for 2014: Body/Material: This practice regards the body primarily as material: physical, emotional and spiritual material. The nature of the training is eclectic and sources from chi cultivation techniques such as Qi Gong and Pranayama, spine and limbs patterns explorations, hands-on work and improvisational elements. I device journey-like experiences, to allow the body to surrender to a state of presence, stressing the transformational potential of bodily matter and the proximity of this idea of ever changing device with the nature of performance practice. Duration, boredom and exertion are recurring tactics, whereas architecture and tracking material and immaterial structures are insisted upon to afford a more precise readability of space. 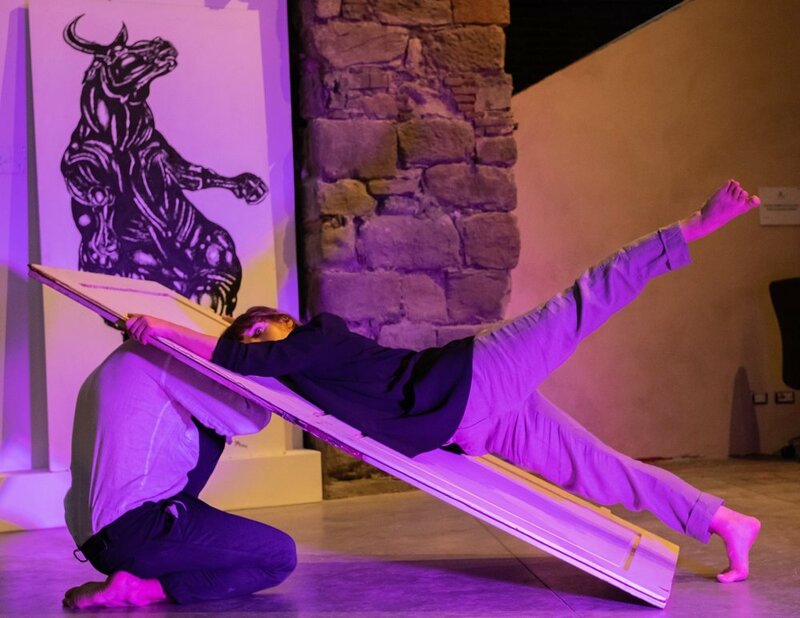 New Dance Alliance’s Performance Mix Festival presents the work of over 30 artists annually in contexts ranging from traditional theatre performances to site-specific installations to open-rehearsals to video screenings to artist talks. 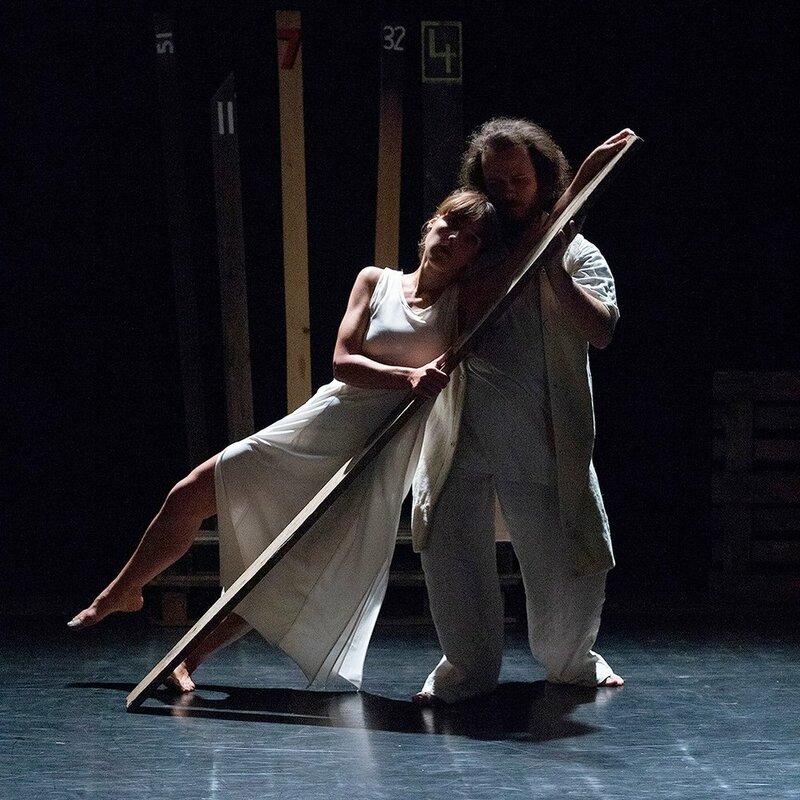 The Performance Mix Festival offers a wide range of avenues for audiences to engage in new explorations in dance, music, video and interdisciplinary performance by emerging and mid-career choreographers. AUGUR is a collaborative multi-media performance work investigating the essential search for meaning through the framework of contemporary oracle, concepts of divination, altered states of consciousness, and ritual performance. Defined as the official in the classical world who is responsible for portending events through reading the flight patterns of birds, AUGUR combines dance installation, sound, projected image, imbued object, and migration pathways to transform the experience of the mundane. Mile Zero Dance, in association with Dc-3 Art Projects, presents the second installment in its highly popular Salon Series: Bringing together audiences and interdisciplinary artists from different media including painting, film, theatre, dance, and music the presentation goes beyond borders and expectations. Presented in an intimate salon-style performance environment this showcase explores border theory and site specific art that accommodates a roving audience and audio bleed. Referencing the work of Tracy Emin, Everyone I Have Ever Slept With (1963-1995), these two performers do the same. Like Emin, the names produced are sexual, platonic, imagined - referring to a certain type of intimacy, rather than strictly a sexual body count. Body/Tents shifts Emin’s work from a stationary installation to a live performance that utilizes the body as both the subject and the material. This performance is not really a performance; it is an act of sharing. It is a durational act. That does not take place on a stage. That does not have, nor need, an introduction or conclusion (but is paired with a program note for those who crave one). We witness names being transcribed onto bodies, an undertaking that becomes a carnal manifestation of remembering. 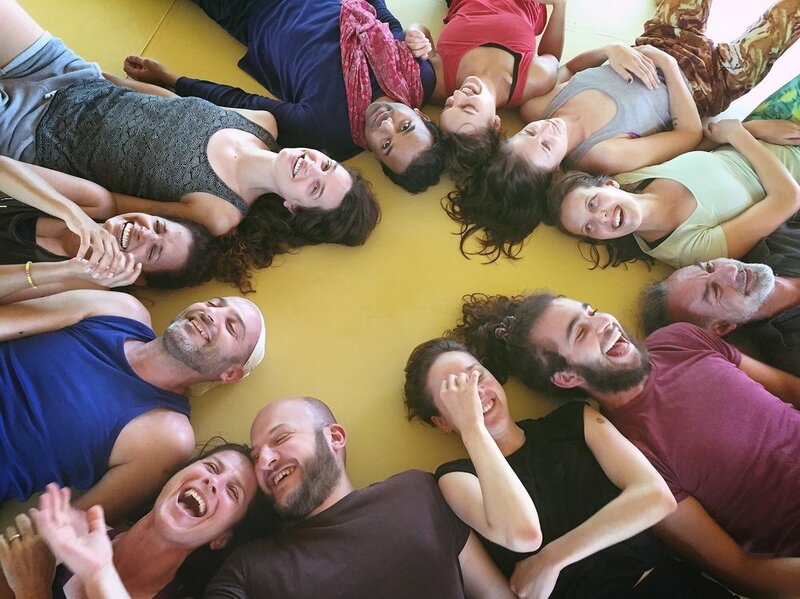 Bringing together all of these people/experiences/memories into one space, and onto one body, the practice offers a personal journey for both the participants and observers. Equipped with their markings, the participants begin to create ‘tent’-like structures with their bodies. The shifting human tent becomes a corporeal installation that mimics the architectural piece prepared by Emin. The audience, free to come and go, will watch from where they like, perhaps choosing to lie under one of the ‘tent(s)’ and reflect on their own experiences. Emin’s work was destroyed in a MOMART fire in 2004. She refused to recreate it. A decade later, Body/Tents celebrates/mourns the ‘disappearing’ of Emin’s work. Our piece finishes when the work feels decomposed. The residency takes place in the bucolic setting of Ponderosa Tanzland in Stolzenhagen, an hour’s train ride from Berlin. It is comprised of a period of focused collaborative creation, a weekend of workshops led by selected participants, and final showings open to the public. This event is Free and open to the Public. No tickets are necessary. Audience members are encouraged to come and go as they like. The performance ritual begins at Anita's Way, and travels down the 42 Street corridor, ending at The Urban Garden Room. Augur is a multi-media, collaborative, migrating performance work investigating the essential search for meaning through the framework of contemporary oracle, concepts of divination, altered states of consciousness, and ritual performance. Defined as the official in the classical world who was responsible for portending events through reading the flight patterns of birds, Augur combines dance installation, sound, projected image, imbued object, and migration pathways to shift and transform the experience of the mundane in the bustling 42nd street district of NYC. Through the interruption of the ordinary in the corridor of Anita’s Way to the Urban Garden Room at Bryant Park, we propose to collide ideas concerning our individual paths towards perception and meaning with each other, and with those who witness. 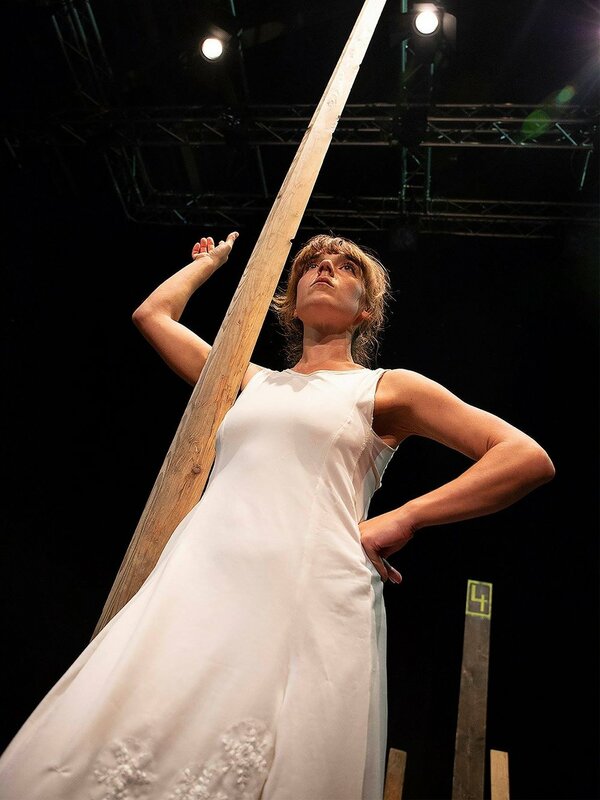 Augur will encourage subtle interaction, and intimate exchange between the performer and witness, creating space for connection, mystery and curiosity. Through the lens of each participating artist and witness, and their relationships to the eternal search for meaning, truth, and vision, Augur explores what is essential in life for a sense of meaning and fulfillment to occur. What is the fundamental nature of meaning? What is the function of the artist and ritual? And, how is the experience of meaning transmitted? Nicole Nigro is an independent dance artist based in Toronto, Canada. She is a performer, choreographer, educator, and workshop facilitator. Nigro’s work stems from her curiosity for human nature and her desire to connect. Nigro examines emotion, intent, and motivation with the purpose of celebrating diversity and fostering empathy. She believes in movement’s potential to challenge our perceptions and provide us with the aptitude to experience life more fully. Anandam Dancetheatre presents Glaciology as part of Kaeja d’Dance’s Porch View Dances. Using the movements of glaciers across landscapes as an entry point, this work explores states of density, collaboration, falling, shearing, collapsing, over population, environmental disaster, mass graves, icebergs, avalanches, lava flows and melting ice caps. These explorations are seen through a moving cascade of bodies to create a human landscape of choreographic activations that examines the question: How do we take care of each other in the face of our looming human and ecological crises? Glaciology premiered at the 2013 Rhubarb Festival and has since been presented in Cologne Germany by the City Leaks Urban Art Festival in 2013 and in Cape Town South Africa by the Infecting the City Festival of Public Art in 2014. We are very excited to share it as part of Porch View Dances (PVD). PVD is an inclusive, community engagement and arts participation project for Toronto. Conceived by Karen Kaeja and with continued development by Karen and Allen Kaeja PVD was designed to celebrate the stories of neighbourhood residents and bridges the gap between professional art and the general public. Engaging real people, in real time, in real spaces the event includes professionally choreographed dances created on and with local families/residents (most of whom have never danced before!) and audience inclusive dance inventions that get spectators participating in the creation of dance art. In collaboration with MataDanZe performers Corrie Sakaluk, Irma Villafuerte, and Victoria Mata. Maggie's Walk explores moments of intense transformation, illuminating the fight to revolutionize a woman's perception of herself and her place in the world. Examining thought patterns as a point of departure for movement patterns, we rewire, rediscover, and plot new directions. Can we truly shift our way of thought? Can we refute societal preconceptions? Can we overcome patterns so deeply engrained in our neural synapses they seem involuntary? Can we rebel from constructs and form new ways of being in society? Maggie's Walk encourages gentle contemplation and brute investigation of our own perspectives. The E|MERGE two-week intensive curates performative and visual artists, activists, and scholars in their experimentation with skill and resource sharing, bridging of known and unknown territories, and creation of new forms from the fields of movement, theatre, visual art, music, installation, design and more. The interchange of ideas, artistic innovation, and the creation of new collaborative models and networks are all emphasized through the work. The residency culminates in a weekend of performances, panel discussions, writing, research and other modes of expression. For E|MERGE 2014 I will be co-directing Oracle with Cory Neale. The process will centre on the discovery of contemporary Oracle, and result in a variety of expressions for each individual. The final presentation will consist of movement, sound, set design, and theatrical elements that will be products of each participant's discovery process. It is expected that each collaborator will investigate movement, visual and sound art-making, and shared personal narrative in order to provide content for the presentation. The processes of each: movement, visual, sound, and theater will be cumulative and on-going in order that each expression be fully informed and not stand as an isolated statement. Movement explorations will inform painting, which will inform manner of shared personal narrative, etc. The PHANTOM WING re-imagines the soon to be demolished 1960s wing of the historic King Edward School before it’s redeveloped as a multidisciplinary arts hub by cSPACE. The Six of Hearts Collective performed a concept we titled Effigy. Through our exploration of the concept and presence of the effigy, we drew upon the history of the King Edward School. The histories of the building and its past inhabitants were taken into consideration, and we channeled them into a performed effigy using cast-off materials from the building. The end result were duration-ed performances and time-based installations. A work exploring the refusal to acquiesce and chronicling women atop a precipice of change. It examines a time of reflection when one recognizes the need for transformation. The work investigates the necessity for conscious adjustments in life: the need for shifts in thought and action, the desire for discovery, rewiring, and new directions. It examines cognitive behavioral patterns and how we can alter them. Can we truly shift our way of thought? Can we refuse what the rest of the world is telling us? Can we overcome a pattern that is so deeply engrained in our neural synapses it is involuntary? Can we rebel from societal constructs and form new ways of thinking, new places in society? Is it possible to see ourselves through a different lens? I believe it is and noncompliance explores this desire for change, these cognitive shifts, and how to share our new perspective. It is a window into a moment of intense transformation, illuminating the fight to revolutionize one’s perception of herself and her place in the world. The work hopes to reveal human complexity: gentle contemplation, stark vulnerability, turbulent strength, paralyzing fear, dogged drive, and ultimately, the will to fight for a healthy perspective. A small portion of the work was shown at the Sterling Studio Theatre fundraiser in 2013. Available to tour. This piece was created as a culmination of my time at ARTSCAPE Gibraltar Point on Toronto Island; Between Intimacy and Architecture: Subtle and Relational Performance in Public Space was a themed residency facilitated by Victoria Stanton. Cultivating attentive awareness, empathetic presence and peripheral vision, the workshop explored the multiple and very personalized ways in which we experience and foster intimacy and connection – in ourselves, towards others, and in relation to place. Take My Hand (Tennnesse Waltz) is a durational performance that breaks down the walls between performer and audience, offering an environment where intimate moments with strangers can take place. Available to tour. I am so grateful for the opportunity to direct a company of committed and talented youth through Canadian Contemporary Dance Theatre. 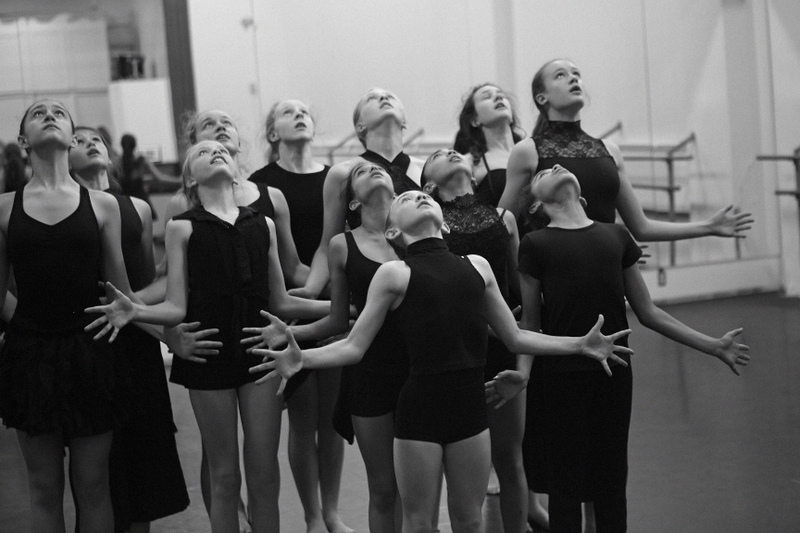 The CORE Apprentice Company is comprised of 15 dedicated dancers training primarily in ballet and Limón technique. During my first year as Artistic Director I had the pleasure of setting three works by three exceptional artists: Arwyn Carpenter, Alysa Pires, and Kate Franklin, as well as choreographing a new work entitled Elysian Fields. The creation process centered around the concept of modern day heroes; what does it mean to be a hero today? What kind of qualities would the heroic possess? We played with the importance of kindness, empathy, compassion, vulnerability, and strength. We journeyed with integrity and built our paradise with connection and caring. Title photo courtesy of Jennifer Picard Photography 2013.